“It’s a great day for tasting Rieslings,” says a cheery woman with suspiciously frizzy, red hair and a glass already in hand. Like there’s a bad day for Riesling? It takes a second to register that I’ve apparently stumbled on an unexpected in-house tasting. Okay, time for a detour from the Toro especially since, according to my chatty, beaming companion, the vineyard owner himself, Johannes Selbach – “such a lovely, daaarling man” – is pouring. Hey, serendipity is good. All four wines are from the Selbach-Oster winery in Germany’s Mosel-Saar-Ruwer region – one of the world’s prime Riesling areas. Selbach-Oster has been growing grapes there since the 1600s and Riesling is the only wine they produce. Frank’s going to be really choked he missed out on this one. A bit fruitier and rounder, this wine presents more petrol on the nose and more sweetness on the palate. I attempt, without success, to find the hint of fizz Johannes experiences but we soon settle for simply agreeing this is a pleasing, comfortable wine – especially at the price point of $17.99. Big mouth feel ensures this wine would pair well with a diverse selection of foods – pastas, tomato and vinaigrette salad, and paella. Easy to see why, at $22.99, this is Selbach-Oster’s most popular wine. “A big step up” Johannes says as he pours the last wine. No kidding. Immediately presenting the nose-tickling petrol fragrance that’s synonymous with classic Riesling, this old vine beauty is well balanced, rich, and complex. Peaches dance at the back of the tongue like kids playing in an orchard where fruit laden branches dip low to the ground. Thanks to the hot 2003 summer, there’s a mouth-cleansing acidity that would pair well with a broad range of foods… or simply with the delights of good company. Definitely one to stock at $39.99. 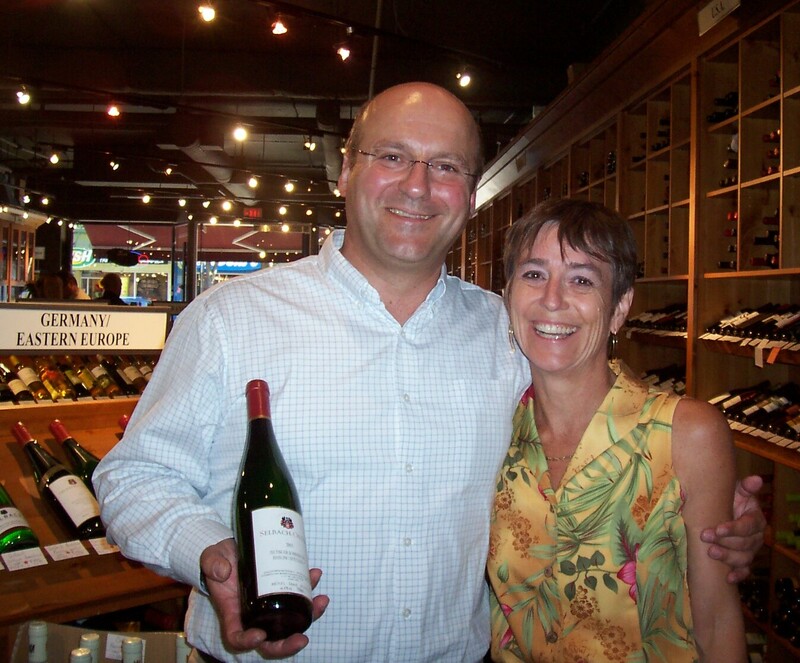 Epilogue: Kitsilano Wine Cellar does indeed have some of the elusive Toro wines – two in fact. Two bottles of the 2003 Vetus are already tucked away for the next barbeque, but they are sharing shelf space with a couple of newly discovered whites from Selbach-Oster. Like the woman said, it really was a great day to savour some Rieslings. This entry was posted in german wine, mosel, riesling, selbach-oster and tagged German wine classification, Kabinett, Mosel, Riesling, Selbach-Oster, Spätlese, Wine, Wine tasting descriptors. Bookmark the permalink.